This movie shouldn’t be any good. It’s adapted from Robert Louis Stevenson’s darkest and most complex historical novel, not exactly apt fare for the Hollywood treatment. It’s the last Warner Brothers film for star Errol Flynn, at this point widely considered a washed-up has-been. And it’s the final movie directed by the ailing William Keighley, who was famously replaced on The Adventures of Robin Hood by Michael Curtiz because he didn’t have a good grasp of filming action scenes. So this should be a mediocre and obvious potboiler, a mere hundred-minute rehash of tired clichés. But it isn’t. Oh, it doesn’t start out very well: it’s set during the battles and aftermath of the final Scottish rebellion of 1745 (the same background as Stevenson’s Kidnaped), and the historical events are mostly conveyed in montages voiced-over by a faceless narrator, everyone’s least-favorite expository device. But someone had the bright idea of shooting the film on location in Scotland, and the Highland glens and castles frame the story convincingly. This also had the happy side-effect of getting Flynn away from his Hollywood haunts, and he looks engaged and invigorated here, deepened and matured but still enlivened by the old charisma. Flynn’s rôle is tailor-made to both his talents and his tabloid reputation: Jamie Durie, in amazing plaid trousers, is the reckless, hell-raising and womanizing elder son of a Scottish laird who sides with Bonnie Prince Charlie in the Rising, while his brother Henry (Anthony Steel) holds down the debt-ridden home castle in support of England’s King George—so the family fortunes are covered no matter the outcome of the rebellion, d’ye see. The disastrous Battle of Culloden goes down (in narrated montage), the Scots’ hopes are dashed, and Jamie, now a fugitive, must flee overseas—but not before he’s betrayed and nearly captured by the English redcoats. He assumes his brother, who desires his fiancée Lady Alison (Beatrice Campbell, fine in her few scenes), is responsible for this treachery, and he vows vengeance as he sails away. But his vengeance is deferred because the skipper of the hired sloop is a villain who robs Jamie of what money he has and presses him and his sidekick, the Irish Colonel Burke, into service before the mast. They sail to the West Indies where—hooray!—the sloop gets attacked by a pirate bark! During the boarding action Jamie attacks the skipper who’d shanghaied him, which so impresses the pirate captain that he takes Jamie and Burke into his crew as officers. The glorious episode of Caribbean pirate adventure that follows is only a few chapters in the novel, but it’s the throbbing heart of the middle of this film. Captain Arnaud, a mincing French dandy played by Jacques Berthier, is a delight, especially in contrast with his brutal ox of a first mate, appropriately named Bull (Francis de Wolff). 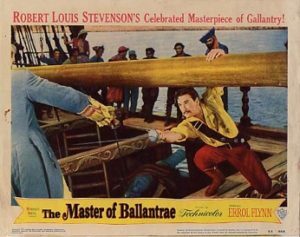 This is also a good place to mention the fine work of Roger Livesey, who plays Colonel Burke with a sly grin. Flynn’s old pal Alan Hale, Sr. had died a couple of years before, or he would inevitably have had this rôle as Jamie’s sidekick—and the movie would have been the poorer for it. Livesey’s Burke is a perfect foil for Flynn’s roguish Jamie, able to go in two seconds from smiling camaraderie to scowling menace. And scowling menace is just what’s needed when they arrive in Tortuga (lovely scenes filmed in Sicily), where Jamie talks Captain Arnaud into a bold plan to steal another pirate captain’s prize, a captured Spanish galleon. Piratical antics ensue, with a fight through town, across the harbor, and aboard ship, ending with a top-notch duel between Jamie and Arnaud (and Burke and Bull) for the ship’s command and possession of the Spanish treasure. (Kudos here to the uncredited fight director, who was a master.) The Scots win the day, and Jamie sets out to return to Scotland with enough loot to get the Durie castle out of hock, and enough swords to enact his vengeance. I won’t spoil the last act, which takes some unexpected turns, but it wraps up in a satisfying ending that’s reasonably true to the novel. It’s a fine swan-song to Flynn’s 35-film career at Warner Brothers, and a solid wrap-up for the underappreciated veteran Keighley, as the screen fades on Flynn literally riding off into a Scottish sunset. Bon voyage, laddy!